First off, a little announcement - as of August 1st I will no longer be on staff at 5 Minutes for Books. Jennifer and the rest of the ladies of the team have graciously let me go. I feel a little stretched these days and wanted to simplify and focus on Reading to Know. So here I am but that certainly won't preclude me from participating in the various carnivals that are hosted on Tuesdays over on the other site. Following the Children's Classic Mystery Challenge earlier, Dawn has stepped in to host Children's Classics for the remainder of the year. The focus is on reading award winning children's classics and if you'd like to learn more about this themed challenge, click here to see what Dawn had to say about it. Several months back on a trip to Powell's, I had scooped up a copy of The Door in the Wall and seeing that it had won a Newbery Award, I thought it would be a great book to kick this challenge off with! If you are as unfamiliar as I was with the story it, I'll help fill you in. It tells the story of ten year old Robin, son of Sir John de Bureford, a well respected knight in the king's army. John has suffered some sort of physical malady causing his legs to not function properly, disenabling him from pursuing training as a page. His father is away at war when John is crippled, as is his mother - who is a lady in service with an ailing queen. John is taken into a monestary and is cared for by Brother Luke who teaches Luke how to carve wood and teaches him patience and various character traits. The title of the book is taken from a remark made by Brother Luke who tells John, "Thou hast only to follow the wall far enough and there will be a door in it." The message is that although John is crippled, he can still prove to be a useful and profitable member of his society. Amazon reviewers seem to not care for this book very well, but I have to say that I rather did. It's a quick 121 page story set in medieval times. There are feasts and monks and kings and it's all very intriguing. I thought it was kinda fun and different. It received the Newbery Award in 1950. 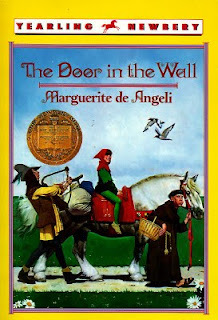 Author Marguerite de Angeli wrote a slew of books and won a handful of awards, including two Caldecott's. She also illustrated many books. (Although I do have to honestly state that I wasn't a big fan of the illustrations in this story!) The Door in the Wall apparently went on to be written into a play, although I can find only the mention of it online and not very much information besides. At any rate, despite the fact that modern tweens don't seem to find much value in this book, it did win a Newbery and I think that says something for it. I don't think it is difficult to comprehend at all, and is, in fact, a delight to read. I'm glad I stumbled across it and I'm very glad to Dawn for hosting the Children's Classics carnival to give me just the motivation I needed to pick it up off the shelf! Thanks! This is an amazing story, although it isn't one that moves fast. But it represents the medieval mindset well and remains one of those great reading memories from my childhood. I've never heard of this book but it looks interesting. Glad to be taking on the Children's Classics for this half of the year! I can't say that I've heard of this one before, but I do hope to scan the Newbery lists from the past to choose selections for next month. And you know how VERY much you'll be missed at 5M4B, right??? My children thoroughly enjoyed this book (the older two read it at 11 and 12). It has some good messages in it, too. We read most of this as a read-aloud before Older Daughter snatched it to finish by herself. Excellent book! I picked up another by de Angeli at the library a few weeks ago -- 'Goose Girl' -- and we didn't like it nearly as well. You'll be missed at 5M4B I'm sure, but I hope the change will be a good one for you. We loved the book and I had my kids draw their own door in the wall while I read it to them and then we talked about how God always show you a way out and a new perspective on challenges in life. Christilulu - what an awesome idea! Interesting looking book - sounds like a great read-along for whenever we get to that phase of history. And, I'm sorry you are stepping down from 5M4B, but I can totally understand. I can barely handle one blog and you have several going on! Oh, I do love this book! It's perfect for middle schooler, I feel, especially for anyone studying history around that era ... England, 14-15th century? (I forget the exact time period). It's part of my Best Books for Middle Schoolers. I do love books where might doesn't win over brains. I'll have to keep this in mind. Sounds like a good "boy" reader! This looks like a really great book. I might have to read it for myself, even though I don't have kids! This was one of my favorite read alouds from the days of home schooling. It's still one of my favorite children's books about the medieval period. I particularly appreciated Robin's persistence.